JUST ASK FOUNDATION is now a 501c3! We just received terrific news from the Internal Revenue Service. The IRS has determined that the Just Ask Foundation is exempt from Federal income tax under section 501 (c) (3) of the Internal Revenue code!!! This is extremely important to the future of the Just Ask! Foundation because now contributions to the Just Ask! Foundation are deductible under section 170 of the code. We are also qualified to receive tax deductible bequests and gifts. We don’t have to rely on t-shirt sales to keep the website going or to fund our speaking engagements. This is what we have been working on since last year. Thank goodness: mission complete. This wouldn’t have been possible without the tireless efforts of William Hughes, a friend of mine and Lou’s, who also happens to be on the board of the Just Ask! Foundation. William was the point person on dealing wtih the IRS and all the government agencies involved to get this special designation. Also, none of this would have been possible without the generous support of Michelle Reed of STANANDLOU Advertising who donated the fees necessary to apply for the 501c3 status. Thank you so much, Michelle! Thanks to William and Michelle, we will be able to raise money through donations, grants, foundations, fund-raising events, etc. and pay no taxes. 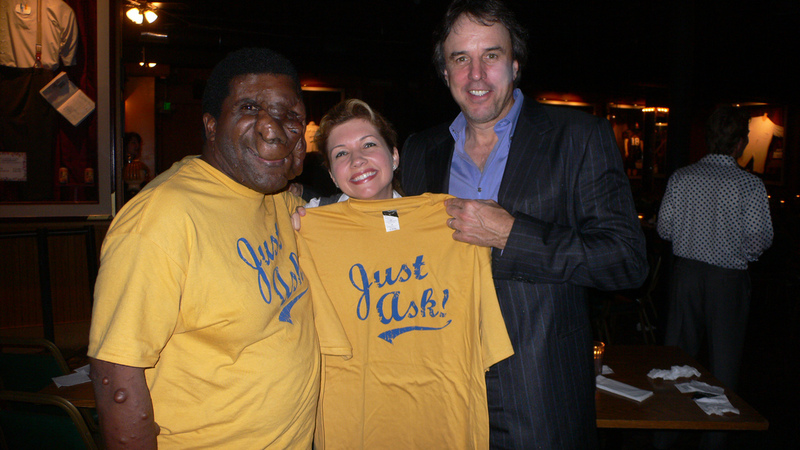 Everything goes to fund the Just Ask!foundation! Great news for all involved! We have a lot of work ahead of us. It is going to be great. We are going to do our best in nf awareness. That is fabulous news! Congradulations! I thought the IRS would have a eye open on Lou. Lou is hanging out at the pool. . .waiting for his drinks to be served. John, I think you are my old neighbor on West Gray. Jeff and I lived downstairs from you in that four plex. Do I have the right John? I think you mean John Person. JohnP lives in the Dallas area. And by the way, where’s my drink…and that other thing. I do mean Person. So I guess that is not him? Bummer. We loved that guy. Where is my pool? you get the pool, i’ll get the drinks. My ex has a pool. #13 Great news that my ex has a pool or the 501c3? rumors have been going around town all week warning the ladies to stay away from lou and pools in general. they make him have to go potty. Have you guys thought about making just ask tank tops for the ladies? i think the roller derby girls would look great skating around in them. Great idea. What would have as the logo? ;) Any ideas? tank tops don’t normally have anything on the back, so i think “just ask” on the front would work. People tend to notice the front of girl’s tank tops. 🙂 then they can “just ask” and we can spread the word. Yes, sounds good to me. Start off with the Roller derby girls. That would be nice to see one or more of the teams wearing our products. you guys never told me if you went to the derby this past weekend. answer me damn it. i mean darn it. The Roller Derby is Saturday. The 3rd Saturday of the month. We are going. Do you think you are going to make it? It is at a new place. Lou can give you that address and time. The new place is kicks. I kept thinking last weekend was the third weekend. what’s wrong with me? We actually can make it this time! Whoo hoo! Oh stop teasing! You are really going to be there? yeah! My kids are staying at my mom’s house. We have a crawfish boil out in Rosenberg, then we are headed into houston for a night out. I am pretty sure jeff will be ok with the roller derby! I will look up all the stuff online. That would be great to see Jeff and you again. If Shana is going then I’m not! on comment 12 Lou would Rie mind if we use her pool ? alright then reggie i will pick you up around 6. f lou. #27 That would be great, Lou. Who wants to see you anyway. Fine. Hope you two get sick and throw up! Gee, what a great come back Lou. Are you on your period Lou? You guys can go straight to Hell!!! Do not pass go. Do not collect $200! Such a nice guy, even when being picked on, he still ask people to come visit him. i must now give reggie props for #36. Props to Reggie for #36. Thanks reggie, I got my 200$. your turn to roll. Shana, I think somebody needs to be spanked! Top of the morning to all. 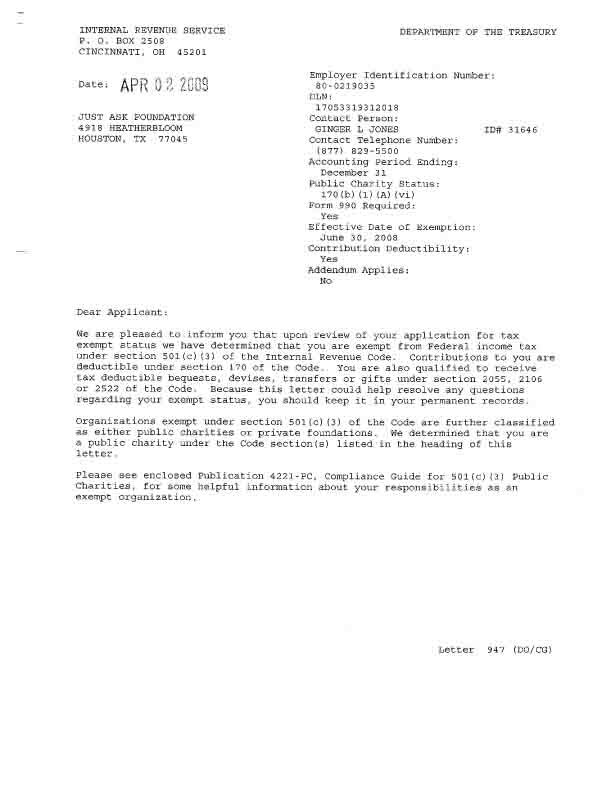 Congratulations on the 501c3. How do I make a donation? Any and all contributions are encouraged and very much welcome as we are running at a deficit and need to buy more t-shirts and upgrade our computer gear to at least 1996 standards! All donors will receive a dated letter or receipt on Just Ask Foundation letterhead showing the donor’s name, amount of donation and signature. A copy of our 501c3 certificate will be included as well. I’m a writer. I may finish a sentence on a period, comma, question mark…all kinds of punctuation. i like to randomly, place. all :all of types, of punctuation> everywhere” especially ,,,commas. i put, them even when, they do not belong. i am also aware i am doing so, when i do it, (yeah i said i am doing it) but don’t care. i, love, commas,! I know what you mean!!!!!!!!!!!!!!!!! Ask William, I love exclamation marks!!!!!!!!!!!!!!!!!!!!! They are so-o-o-o-o-o-o-o cool!!!!!!!!!!!!!!!!!!!!!!!!!! i prefer. . . to !!! but whatever floats your boat. I can’t wait till Saturday night. . . I have full intentions on inviting myself to do whatever you guys do after the derby. We’re having a tequila-chugging contest in the hot tub with Wesson Oil and the Derby girls with their pets.